Christmas has come and gone and you have 365 days to prepare yourself for the best holiday the year has to offer. WRONG! You have 5 days to prepare yourself for the best holiday of the year! 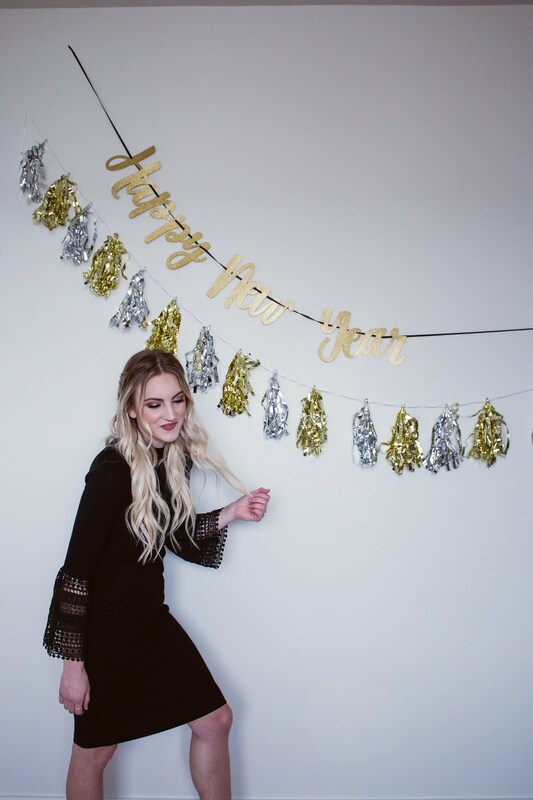 New Year’s Eve has always been my favorite time of year to look forward to. The next few days I’ll be posting fun game ideas, easy treats, and my favorite outfit ideas. Now I totally know what you’re thinking. C’mon, New Years is always overhyped with these high expectations and then it ends up pretty much being the worst night of the year. I feel ya! I fell into this trap almost every year as well. But then I remembered, the night is what you make it. And whatever idea you come up with is a dang good idea, so roll with it. Have confidence in yourself and make the night one to always remember! And that’s what I want to help you do this year. Starting with that perfect outfit that will either rock the night away or keep you warm and cozy. For whatever “Ringing in the New Year” means to you. For me the night is going out, getting fancy, and enjoying friends while the countdown is coming hour by hour. I found this gorgeous Little Black Dress and had to have it! The hunt was harder than you would think for a black dress that had a unique feel. It is a tighter fit, giving a party vibe, but is so comfy and the length is perfect, hitting right at the knee. 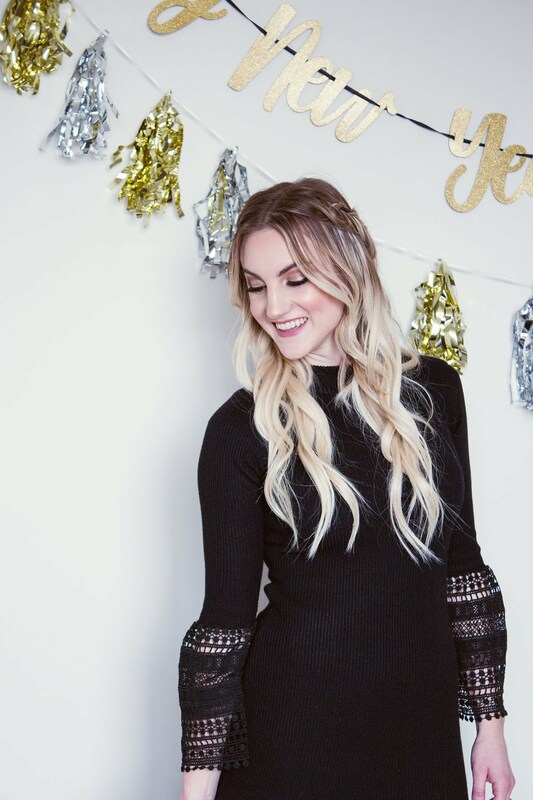 The bell lace sleeve gets me every time. I get so distracted wearing it because I just sit there looking at all the gorgeous details. Its simplicity keeps it comfortable and something you could wear year round for sure. I’m 5’5″ wearing a small. The dress is also sold in burgundy. It’s from Wren and Ivory called The Reign Dress and you can always use the code LOVEWREN10 for 10% off your orders! 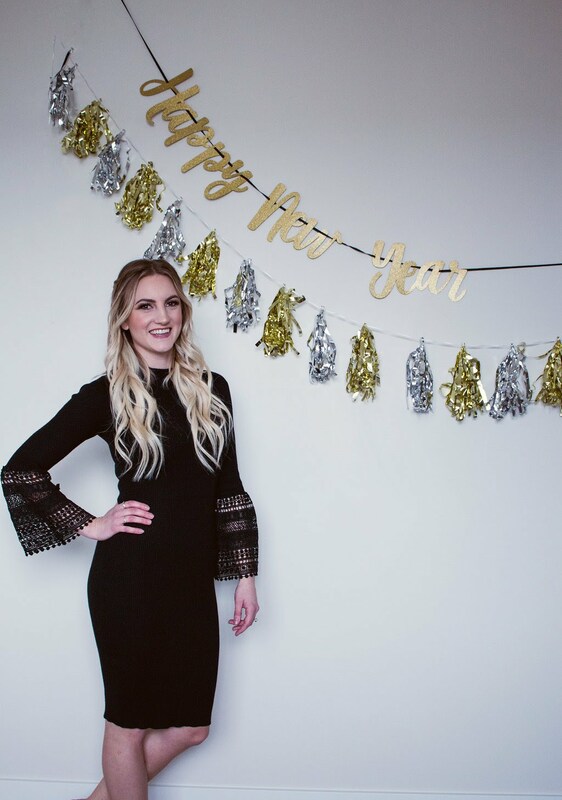 Looks like Wren and Ivory aren’t sending off products before the holiday so here are some other Little Black Dresses that should get to you on time! Madeline Metallic Skirt from Journey Five that would be so cute with a black sweater. Ruffle Slit Dress by Who What Wear from Target. They also have pretty silver and gold dresses right now. 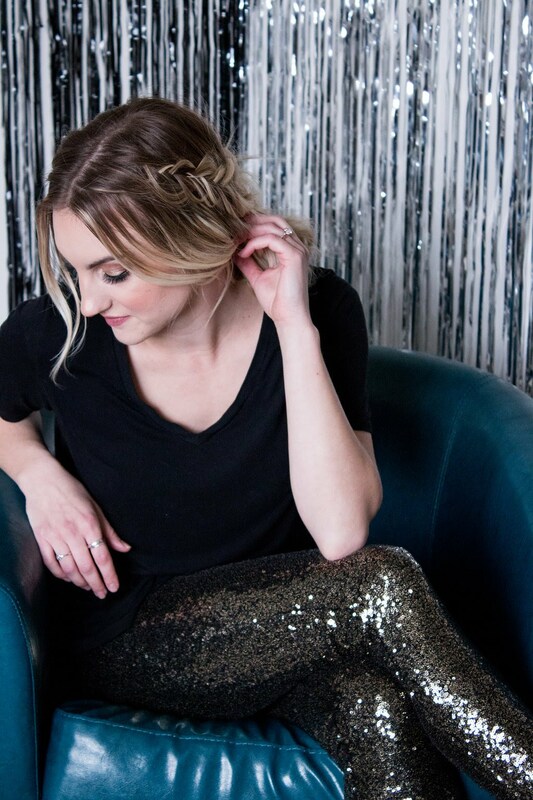 A more casual look that I fell in love with are these amazing sequin leggings from IvyCityCo. They have more stretch to them than you would think and they are just as fun as they look! I got a small, but they don’t fit as high as other leggings so probably should have gotten a medium. I paired them with a simple black v-neck. They would be cute with an oversized sweater, or solid colored sheer blouse. But the sparkle is SO fun and a different way to show your shine. But like I said before, I know some of us enjoy bringing in the New Year in our sweats, probably even sleeping. I’ve had those years don’t worry. So here are a few cute comfy pieces that could get you through the night. Lucy Red Joggers from Brickyard Buffalo. Use code AFTERCHRISTMAS50 for 50% off! They have a few different colors and styles as well. I’m just slightly obsessed with the red stripes! The Classic Cap from Brickyard Buffalo. Yes, I wear these around the house. Weird? Maybe. Trendy? Totally! Cheers Graphic Crew-Neck Sweatshirt from Old Navy. Got their crazy good winter sale going on right now and this top is perfect for I’m here to party, but also nap, vibes. 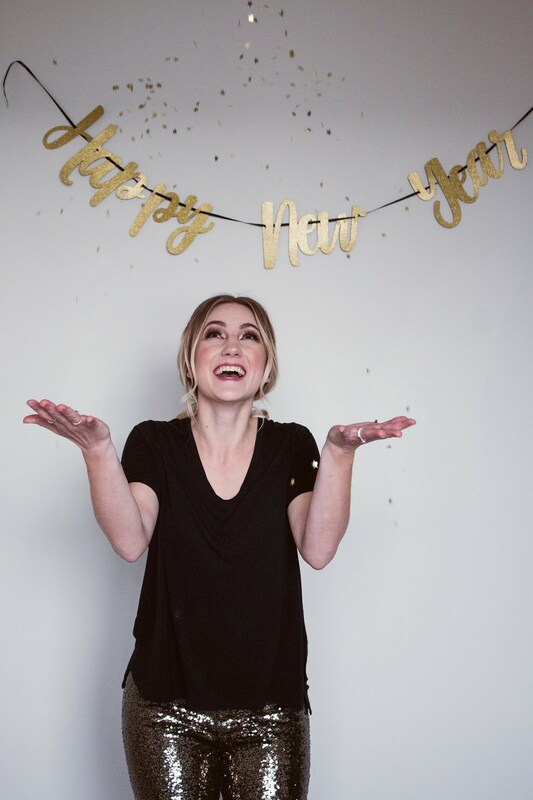 “Be” Sweatshirts from Jane such a cute way to express your year’s resolution. Jane only holds onto products at their sale price for so long. So if you miss the sale you can find the product at Cents of Style as well. With the big night coming quick I hope this helps you find a way to bring in 2018 with every bit of confidence, from your head to your toes! 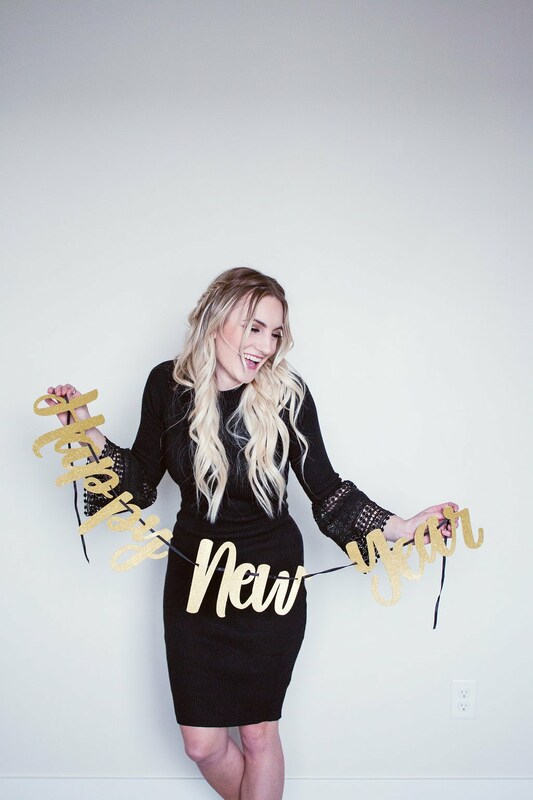 Finding the right outfit to express you and what your year will bring! There will be more ideas on games to play with family or friends later this week along with yummy treats to help keep you awake. Thank You! It was all really fun to put together. Oh my god, these looks are so cute! I love these pants. Thank You! They are surprisingly comfy too!